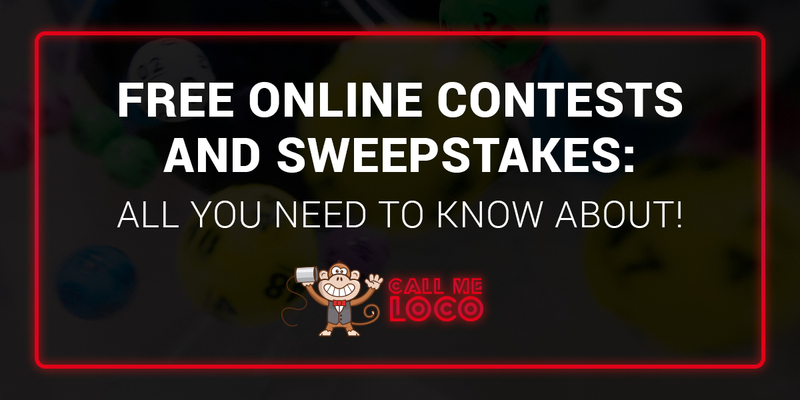 Call Me Loco | Free Online Contests And Sweepstakes: All You Need To Know About! Free Online Contests And Sweepstakes: All You Need To Know About! 13 Mar Free Online Contests And Sweepstakes: All You Need To Know About! Persistency is the element which pays you off in the sweepstake. The sweepstake is a contest where prizes were given to the winner and you can win if you do entries in every single day. There’s a lot of online contests and sweepstakes running every day, but there are scammers all the way who do online fraud sweepstakes and grasp the attention of people to their sites. Many times for people winning a sweepstake is like a dream comes true, but sometimes it also becomes a nightmare. Sweepstakes sponsors instructs that everyone has a same chance of winning as it’s in the guideline too, to motivate people. Everyone cannot participate in sweepstakes there are some restrictions like age range, residence, affiliation or gender, etc. Typically players make some mistakes while doing entries to the sweepstakes which they are not supposed to. Here we are listing some critical point which everyone had to know before getting enter to the contest. Identify the difference between sweepstake, contest and lottery before getting into it. The sweepstake is a contest where a person will receive prize without any charge; the contest is win prize by doing something better than others while lottery raises money by selling tickets. Equal dignity is given in the online contests and sweepstakes as people go and buy many pins and tickets just to raise the chance of winning while they have to understand that it’s not based on this theory. Don’t allow everyone to enter in your promotion as there’s scamming all the way. We need to put efforts to convince that sweepstakes offerings are legitimate and no scammer is involved in grabbing attention and taking your prize. Get the most trusted sweepstakes promo code! Always go through the rules before entering into any contest, sweepstake or lottery. People don’t care about rules and regulations and get into it. At the time of winning or scamming they got aware of rules and then it’s too late. Don’t change rules once promotion begins as it’s a violation of the rule and illegal act. And if, you made any changes in rule than consult an attorney before doing it. Make sure that law is on your side to save yourself from the issue of sue. Sweepstakes directories pull together all trustworthy sweepstakes on one website so that you can find it easily. Sites give you information about prizes, tell the rules, regulations and provide information about eligibility. Everyone has to know about trustworthy directories before entering into sweepstakes. Prevent your typo information from the sponsors like street address, contact number and email address. Get chances from sweepstakes but don’t use them all as using less opportunity improve the profile. Give sometime regularly to the entries as it gives broad range and helps to win more. Check emails regularly and phone calls as if you miss any it will lead to losing the prize.